Years after Apple’s “Find My iPhone” app successfully reunited thousands of loyal fans with their lost/stolen $750 mobile computing devices, Google, late to the game, has finally decided to fill in the increasingly conspicuous gap in their app ecosystem. Live as of this very moment in the Google Play Store, the official “Android Device Manager” app promises to be to Android users what the “Find my iPhone” app has been for Apple fans for the past three years. The Device Manager is a free application that will work on any Android device running Gingerbread (OS version 2.3) and up. 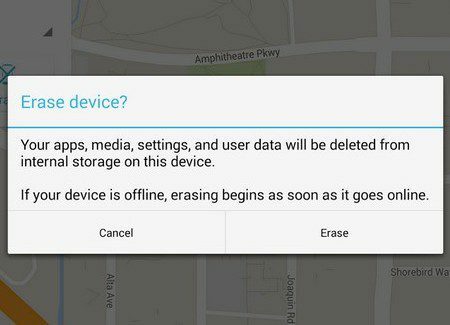 According to Google, Device Manager will allow users to locate and track a wide variety of Android devices, while also keeping their personal data safe from prying eyes. The main feature of this application, as you would expect, is the ability to locate and track the movements of your Android devices, anywhere in the world, through the power of GPS technology. Once located, you will also have the option to switch on an alarm, making it a whole lot easier to find your misplaced device (or alert any would-be thief to turn it off). In order to use this (or any other) feature of the application, you must first sign in to the app/website with the Google account that is associated with the device you that would like to locate. Once signed in, you are then able to “manage” all of the Android devices linked with that account. Did a dastardly devil have the gall to ransack your belongings? Did he/she make off with your brand spanking new Galaxy smartphone/tablet? Another handy feature of the Android Device Manager, is the ability to wirelessly reset the password for your device. You can also add a password if, for some strange reason, there was none there previously. After running an extensive series tests (about 5), I feel confident in saying that this feature will work approximately 99.9 percent of the time. Google has also included a more extreme solution, for those situations where you (and everyone around you) realizes that all hope has been lost. As a last ditch effort to protect your data, the app allows you to completely wipe your device, effectively performing a wireless factory reset. For the purpose of full disclosure, I did not personally test this feature of the app (in fear of the annoying aftermath) but, based on the mass of Twitter users who managed to accidentally reset their phones/tablets, we can safely assume that this feature does indeed work; at least some of the time. One of the biggest issues with this application became apparent to me the instant I opened the app. For some reason, Google thought that it would be a brilliant idea to not require a password (or any other proof of identity) when logging into the service through the mobile app. As a result of this massive oversight, if the individual who has stolen your device so chooses, he/she is able to log into the Device Manager and disable all of the other devices that are associated with your account. Worse still, they would also be able to see the location of your devices, at which point, there would be absolutely nothing to stop them from tracking your devices and possibly even stalking you. All in all, the Android Device Manager is a much needed addition the Android ecosystem. The interface is childishly simple, and the features, based on the test that I have performed, seemed to work exactly as promised. Have you already downloaded the Device Manager application? What issues, if any, have you notices thus far? Wow! No lock out on the mobile app version for intruders who have your phone? Pretty dumb google. ALL IN ALL though, this app seems pretty useful and awesome to keep away thieves. Great post Adrian!